Twinkle Twinkle Little Star music for guitar and violin, with a super-easy sheet for violin beginners! Is this necessary, when students should learn Twinkle by ear? Well, it can help A LOT. Scroll down the page for the links to the free downloadable PDFs. Especially with young students whose ears may fool them when they are at home (yes, there are those students who don't play easily by ear - they tend to be the same ones who don't notice they are singing off-pitch), this sheet serves as a useful guide! In addition, there are four Twinkle versions of sheet music and guitar tabs with not just the melody, but also easy duet parts for your brand-new beginners. Here is the basic melody, with guitar tabs and Twinkle Twinkle Little Star chords. Think this is easy for a beginner guitar player? 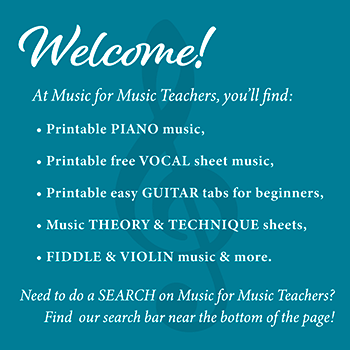 Do your beginner students know what the letter names over the treble clef music are for? (The chord symbols, I mean.) I take care to point these out and ask them if they can guess what they are. What's confusing for beginners is that often a chord symbol is placed over a note with the same name, as does occur several times in the Twinkle Twinkle song, over an "A" note. This easy teacher/student guitar duet has a satisfying sound - if students use their thumb instead of a pick to play it, the result is a classical guitar sound! And using the thumb offers a good opportunity to teach them the REST STROKE, where the thumb or finger presses through to the next string, stopping the motion by coming to rest on that string. It gives a feeling of control to beginners. I recently wrote this open string duet part for a new student. She happens to play piano as well, so she can read the notes, but even if she couldn't, it wouldn't be hard for her to differentiate the 3 notes used (A, D, and E). Initially, she played it pizzicato (plucking the strings instead of bowing), but she is now bowing the open strings. Simple though the little duet may be, it is still satisfying to be making music together.